Notice on the label “no sugar, no preservatives”. Choose kraut with just cabbage, water and salt in the ingredient list. Really sauerkrat? Why on earth would I choose to highlight sauerkraut?? Sauerkraut is fermented cabbage. Sounds yummy, I know. But I actually do really like it! I will be presenting foods that support healthy digestive flora on KVOA today as the start of Irritable Bowel Syndrome (IBS) Awareness Month. The healthy, friendly bacteria in your digestive tract are commonly referred to as “probiotics”. Sauerkraut acts as both a probiotic and as a prebitotic. Sauerkraut is fermented with the addition of lactic acid which is a probiotic. Sauerkraut also provides fuel for probiotics, which is why it is also a prebiotic. Because sauerkraut acts as a prebiotic AND contains probiotics, it is a food that is highly supportive of a healthy digestive tract. Keeping the bacteria in your digestive tract is not only something that those with tummy troubles want to pay attention to. A significant portion of your immune system resides in your digestive tract, so a healthy gut promotes immune function. Sauerkraut is a welcome addition to a varied diet as a side dish, side salad or sandwich or salad topper. That is unless you don’t tolerate cabbage…for some people with IBS, cabbage may cause gas and bloating. Management of IBS is highly individual, there is no one-size-fits-all approach. While this may seem discouraging, think of yourself as a mini-experiment. Try different foods and see how your body reacts. For many people, sauerkraut is a tangy, interesting food that can promote improved digestion and a stronger immune system, but if it doesn’t work for you, stay tuned for more tips and tools for managing IBS. Sauerkraut isn’t that common, so how would you use it? I have a few ideas, but send me more. 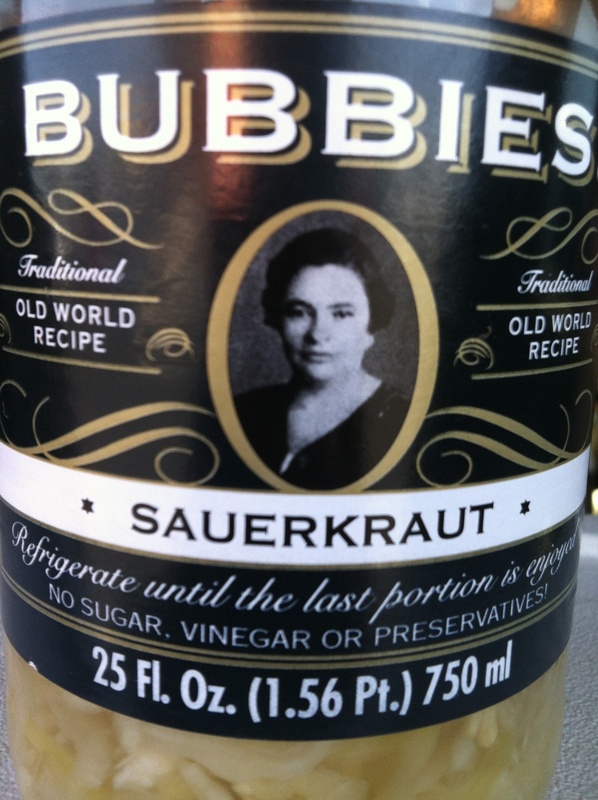 I do like sauerkraut but don’t use it often, so I’d appreciate more ideas. 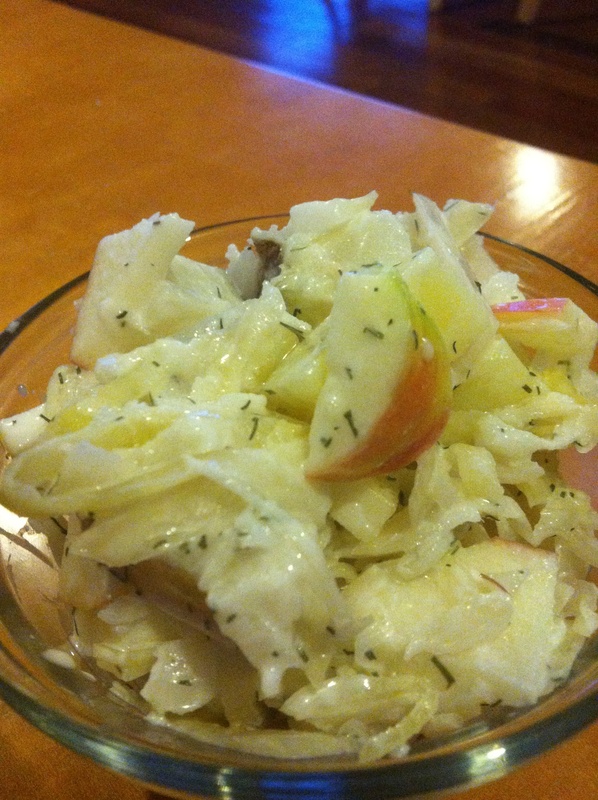 Throw in a bit of sauerkraut in potato salad to lighten up the salad and to add flavor. Here’s a potato salad that I made up yesterday for dinner. Onion also has a prebiotic effect and the yogurt I used has “live active cultures”, which means that it contains active probiotics. 1-2 cups sauerkraut, depending on how much you like sauerkraut; I only used 1 cup and then added more because I like sauerkraut so much! If you don’t have cooked potato already, start with that. Dice potato and boil until soft, about 20 minutes. Drain and use 1 cup for this recipe. I saved the rest of the cooked potatoes to sauté for another meal later this weekend. We like to sauté potatoes, onion and garlic with eggs for breakfast. Mix all ingredients together and enjoy! Season as you like with more sauerkraut, dill and vinegar. 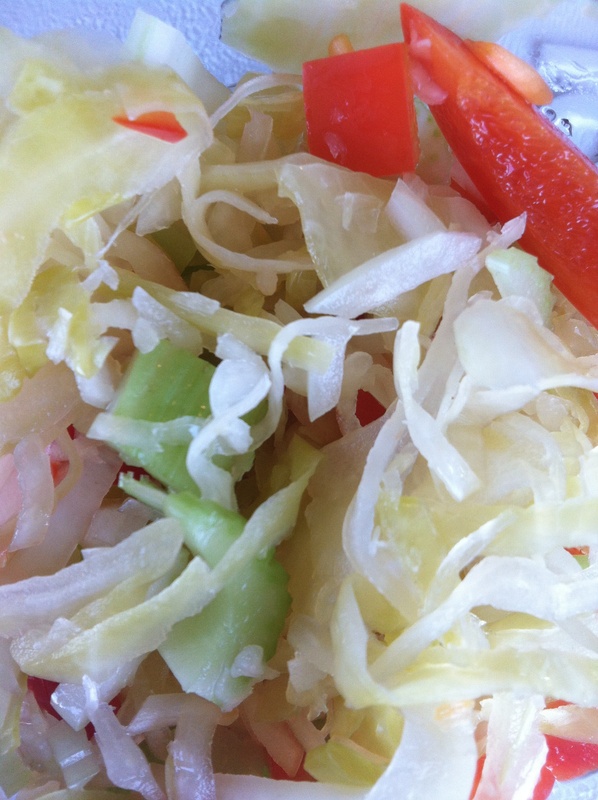 Try a new twist on “slaw” and make a cold, chopped salad with sauerkraut, chopped bell pepper, celery and onion. You could add cider vinegar and touch of non-GMO canola or olive oil, or not. I made a quick salad this morning just mixing the veggies together and the liquid from the sauerkraut was enough moisture and flavor to skip the extra ingredients of oil and vinegar. You could also experiment with using some sauerkraut in your traditional coleslaw recipe. Next time you grill burgers, think of this idea for a side salad. Saute sauerkraut with diced onion, minced garlic, chicken sausage (Adele’s, Applegate Farms or Trader Joe’s), and diced bell peppers. Add diced sweet potatoes or apple for a complete meal. Sauerkraut is traditonally served with high fat meats such as sausage, keilbasa or pastrami. Since I don’t promote eating processed meats on a regular basis, try topping a chicken breast sandwich or a veggie sandwich with sauerkraut. It’s also a great salad topping since it has a nice zesty flavor and crunch. It is also simple side dish with savory meals. What Do You Do to Manage Stress…That Doesn’t Involve Food? I like it with mashed potatoes. Just add the saukraut after you have put in all the other ingredients you normally add just before serving and mix it in thouroughly. It makes it less sour for the children, or folk who don’t like it as much, but want the health benefits.